Let’s start with a little history. In 2007 Panbo enthused about ActiveCaptain as an innovative crowdsourced alternative to the often outdated POI (point of interest) info available on many electronic charts. 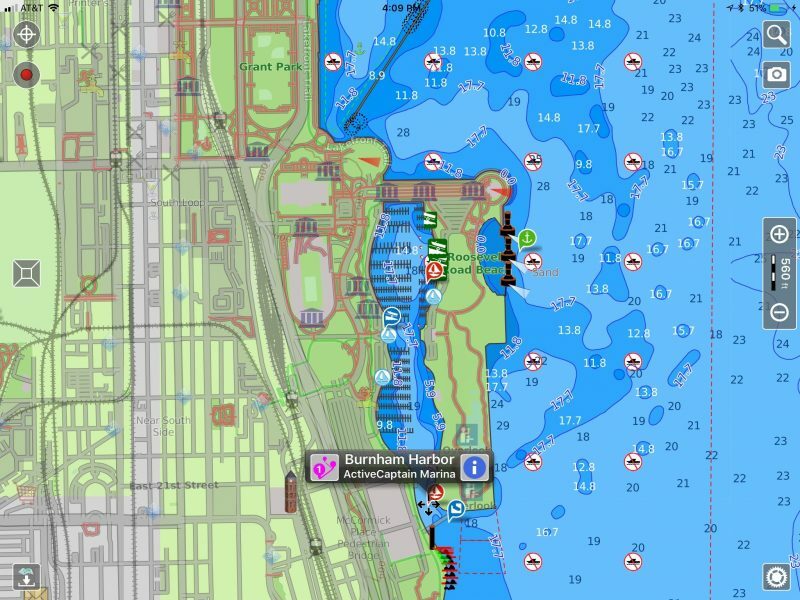 Actual captains would actively create and update a database of info and reviews about marinas, anchorages, hazards, and more. Key to the concept was making the data available and editable on as many screens as possible, and it all worked out very well. 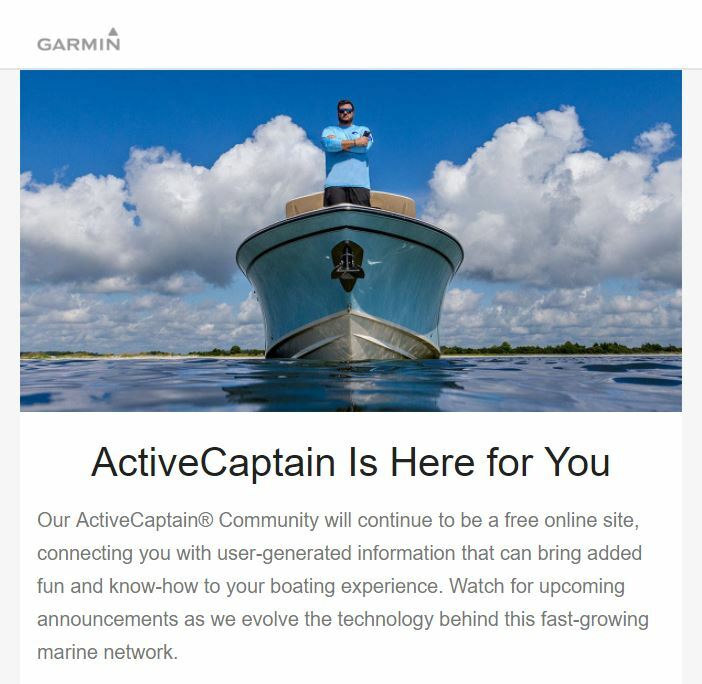 Last fall Garmin renamed the original AC as the ActiveCaptain Community. 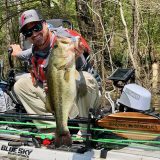 If you register as a community member, you can see the massive amount of information that’s been collected by many thousands of boating contributors over the years. And without registration you can still see all the third party apps and charting programs that currently display AC information. 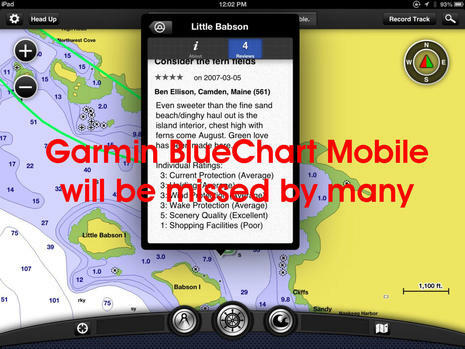 Unfortunately, the name change and simultaneous removal of Garmin’s Blue Charts Mobile from the app store (detailed below) caused further negative speculation. Would ActiveCaptain be converted into a subscription service? Would it be limited to only Garmin products? And the worries were thrown into high gear when news of ActiveCaptain’s data API being discontinued hit the Internet. Fortunately, we got to hear the whole story from Garmin’s Ken Cirillo, product manager for marine cartography and content, and Robert McVey, backend connectivity manager (I’m not making that up). Early in our conversation Ken emphatically stated that ActiveCaptain as we know it is here to stay. “We aren’t limiting it, we aren’t closing it down, we aren’t charging for it! We’re looking for ways to expand it,” he said. This was great news to me, as I’ve been hoping since the acquisition that Garmin would make an official statement about ActiveCaptain’s future. Ken and Robert expanded on that good news with statements like “We know we need AC to run on as many platforms and as many places as possible.” And again addressing the common concern about Garmin monetizing their new acquisition, Ken said, “ActiveCaptain will be free for users and developers.” Garmin’s commitment to the AC Community and their recognition that a crowdsourced service won’t grow with more limited access seemed clear to me. The Garmin team also explained the notice sent to ActiveCaptain development partners on Wednesday (and posted in full on the ActiveCaptain Facebook page by friend-of-the-company Todd Driscoll, shown above). Yes, the current ActiveCaptain Community data feed will be discontinued on 5/23/2018, but it will be replaced with a new and purportedly improved application programming interface (API) that also meets the EU’s General Data Protection Regulation (GDPR). Ken and Rob explained that some portions of the API need to be changed to protect the privacy of ActiveCaptain users to be compliant with GDPR. Apparently it’s hard to judge how hard the change will be for different developers because different techniques were used over the years, but Garmin believes the implementation will be straightforward for most of their partners, and also that the new API will provide a clean and solid foundation moving forward. But Garmin’s apparent good intentions don’t mean that every partner will make the move to the new ActiveCaptain API. In fact, Polar Navy has made it clear that their various apps will not display AC data updated after May, and we’ve heard from other developers reluctant to do the work involved. On the other hand, Garmin may have created a nice opportunity for good AC apps. I refer to the disconcerting move Garmin made last fall, when it discontinued its own AC integrated app, BlueCharts Mobile. 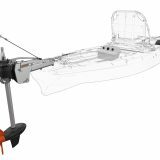 BCM was many cruisers’ first choice for ActiveCaptain display dating way back (Panbo’s 2012 review here). Garmin ended BCM because they were bringing out a new app — confusingly named ActiveCaptain, and reviewed here — that didn’t replace BCM for many users. In a bit of timing I’ve never been able to figure out, BCM was removed from the App Store before the new app wasn’t even available. 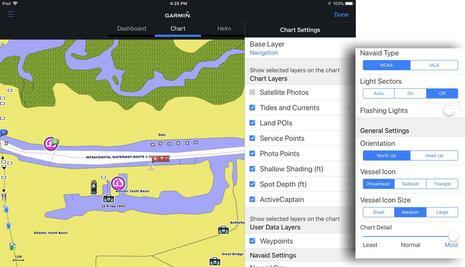 Then it became clear that ActiveCaptain the app is primarily designed for owners of Garmin electronics (though it does display ActiveCaptain Community data). Lessons possibly learned here are that large operations like Garmin can sometimes move in clumsy ways and can also struggle to express their intentions. But the fact we’re left with is that many ActiveCaptain users are hungry for more choices in ways to use the data. Perhaps that, along with the new API and the strong commitment from Garmin’s management, will encourage developers to show us new and better ActiveCaptain implementations. Aqua Map confirms new ActiveCaptain API integration! Thank you for getting the correct story and posting it for those interested. Most of Garmin’s changes make sense. I still am baffeled why they discontinued BCM. It was a great entry product and would have kept non-Garmin owners in their product queue. For the other brand owners that are not going to spend $$$ for charts for the new Active Captain app, they have created a negative taste. It would be great if they would now add Active Captain data to the Navionic’s application, but only time will tell. I hope that Ken and Rob from Garmin were a little panicky and more than a little embarrassed about having to do this damage control on Panbo. This whole Polar Navy episode is horrible PR and product management. When will Garmin release ANY info about the new API, so that developers can start to adapt?  Currently, the AC developer page ( https://activecaptain.com/help/developers-index ) is completely empty. Not exactly confidence-inspiring. HenryD, I totally agree that discontinuing BCM was a confusing move. I’ve also come to realize that people like me who can get “free” charts on the new ActiveCaptain app (because I already have Garmin plotters with the charts) are not yet getting as good access to AC Community data as BCM, and some great BCM planning features like weather are absent. But what’s done is done, and I don’t think Garmin is going back on the decision. So what’s really interesting now is the opportunity for other charting app developers to replace or even improve on BCM. And I now thoroughly believe that Garmin is going to support those efforts. I was on the conference call with Ben Stein, and I’ve also known Ken Cirillo as a straight shooter for over 15 years. (He also managed C-Map USA for many years and really knows electronic charting.) Ken was not only emphatic about keeping AC data free for developers and users, he was emphatic about why that makes complete sense for Garmin. Apparently it is going to be a big project for some development partners to adopt the new AC API, but I hope a lot do, and I also hope that apps like iNavX, TimeZero, and Embark add ActiveCaptain data display and entry. Ken, Don’t you think that Polar Navy also deserves some blame for the fake news that Garmin was simply dropping AC support to 3rd party developers? After all, they only published the portion of the notice discontinuing the current API, and didn’t mention the new API at all. Incidentally, Robert told us on the conference call that the April 1 date for the new API is the worst case date for having the API and a test server completely ready to go. They hope to have some or all of the materials ready before 4/1. As for Garmin, one thing that has slowly struck me during the changes with ActiveCaptain is how hard it may be for a big public company like this to put intentions into written policy. I can formulate a Panbo policy and state it immediately without having to worry about upper management, let alone a legal department and restrictive policies about what gets said in social media and elsewhere. Hence, we have the most definitive written statement of Garmin AC policy I’ve yet seen in a Facebook post by a friend of Garmin! Finally, Garmin did not ask Panbo to write this story. In fact, it’s quite the reverse. Ben Stein and I asked Garmin for clarity about ActiveCaptain access during the Miami show and still had not heard back when Ben S spotted the Polar Navy posting. We then talked with several AC developers and got some of the bigger picture. Then we contacted Garmin and told them we were going to write about the situation as best we could, and again asked for clarity. That’s how the conference call happened and I’m so glad it did, because we might have inadvertently contributed to the fake news aspect of all this. I don’t disagree, but remember this ‘fake news’ propagated because Garmin themselves seem to have been utterly silent about these changes, recently. The most recent AC newsletter is July 17 of last year, the developer’s API page is embarrassingly blank. Why wasn’t there some sort of posting somewhere on the AC or Garmin sites to coincide with the API change notice sent to groups like Polar Navy? Clearly there’s been some tactical errors in rolling this out. It’s a self-inflicted PR wound. I hope they sort it out soon. Garmin stuff is cool, AC is awesome, it’s definitely a treasure to the boating community, and I’m keen to experiment with the new API. Although Garmin has never been reluctant to inconvenience some of us when it suits their corporate business plan, it’s obvious that, without the enthusiastic support of the boating community, AC will soon be out of date and useless. As an example, I recently visited Progreso and Yucalpeten, Mexico, and toured 8 marinas, one of which is up to our Kemah standards. AC, BCM and others show one marina, the smallest of the eight. Since that area enjoys good sailing winds 365 days per year, and short distance access to other desirable destinations, I immediately thought about reviewing them for AC. I’ll wait to see how Garmin proceeds. You hit the nail on the head. I think this is the key to the entire situation. Garmin’s interests are aligned with the cruising community. Garmin can’t maintain the value of their asset if it’s not updated. If access is restricted it won’t be updated and the value will decline. What we heard on the call is that Garmin understands that. Thus far they haven’t done a good job demonstrating that understanding but I believe the understanding is there. Hopefully the turbulence is nearly behind us and things will get smoother from here. While Polar Navy’s announcement may be alarmist and misleading, some of the other statements they made in the shared forum link are disturbing and accurate. Apparently the new terms required to connect to the API include some form of indemnification where the integrator needs to protect Garmin. 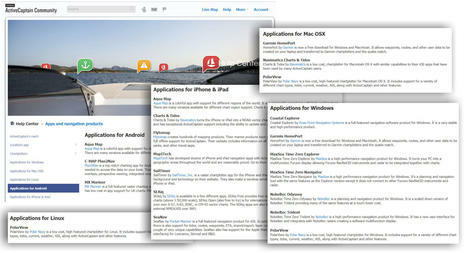 For an API focused on user contributed content, I can understand why Polar Navy is concerned. They would need to evaluate each submission prior to sending it along to Garmin in order to minimize liability. Second, as they mentioned, having only 54 days to implement major changes to an API is pretty ridiculous. I work for a software company and between writing a new spec, developing the software off that spec and then doing QA on the resulting product.. well, for a small dev team, 54 days means dropping many things being currently worked on to focus on integrating someone else’s product into your own. I’d be really pissed. Do you pick to work on that evolutionary feature that moves your product forward, or do you work on updating something that several other products have and that doesn’t make you different but that you are forced to consider to maintain feature parity? Garmin should really extend the deadline by another 90 days and reduce liability requirements to be more in line with current standards on integration and sharing of third party data (I don’t know what the new indemnification requirements are but if they are similar to the stock language in other Garmin products then they need to be changed). IMHO. Chris’s comments are well made. Regarding indemnification, breach of the new European Union GDPR regulations can can lead to astronomical penalties. I cannot see any software development company in their right mind signing an agreement that indemnifies Garmin against that. While I’m sure that Garmin’s corporate lawyers can write egregious CYA licence terms with the best of them, I suspect the new API agreement is no more d!ckish than any of the myriad SLAs that all of us have already signed with M$, Facebook, etc etc. Of course I don’t know for sure… because Garmin hasn’t shown it to us yet. Their AC developer API remains bare-arse empty. Disappointing, but I hope they’ll remedy that soon. Despite being critical of Garmin’s handling of this, I have been maintaining to others that yes AC will still be free to use and widely available, and it would be nice to have my faith justified. I don’t understand how PolarNavy’s direct quote of Garmin’s message to them is turned into “fake news.” They’re not a multi-billion-dollar global company. I think they’re one guy writing some great software and making it available at very reasonable prices. Painting them as the bad guy is not appropriate. 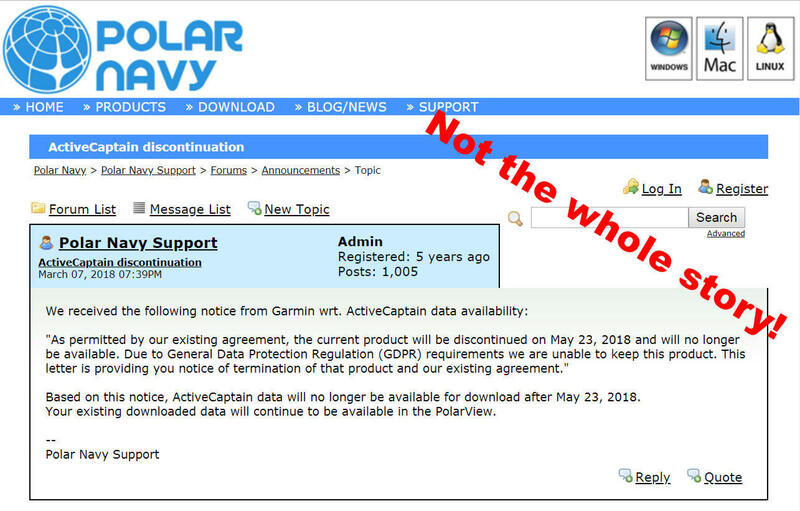 I think they’re being quite straightforward with their customers: Active Captain is going to stop working with PolarView on May 23, 2018. …which is simply not true according to the full text of Garmin’s notification to developers. 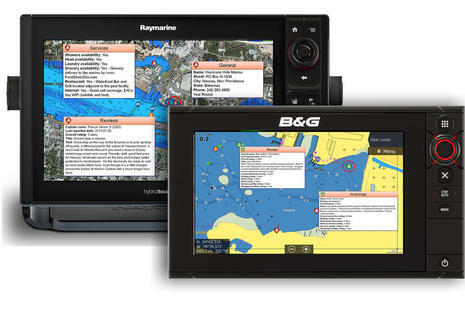 However, there may well be major issues with how Garmin is changing the AC data service, as expressed above by Chris L-S and BoatBeacon. I guess we won’t know for sure until June how many AC partners will adopt Garmin’s new terms and API, but even if it’s just one or two — I sure hope not — the AC “data will no longer be available” scare won’t look good for those who perpetuated it. OK I’m commenting so I’ll get emails about future comments..:) But I will comment that Garmin shares a bit of the blame here for not being willing to communicate it’s vision and plans. For most companies, there is a very understandable reluctance to do this in order to preserve their market advantages – but when you’re marketing a public-source resource, the opposite is true. I’m a committed AC user, but I’m not going to contribute to something that won’t benefit me at least as much as it already does. 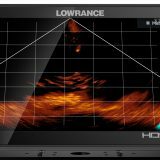 “From the indications so far, the new API is not something that can be technically integrated into PolarView. It’s nice to see that PolarNavy’s position is evolving, but it would be better still to see their announcement clarified. It’s linked to from several discussion groups like Facebook’s AC group, still causing consternation, and PolarNavy’s recent comments are not shown if you go that announcement link. So is the API out? (it’s close to 4/1) Hard to fault other providers for being skeptical about integrating something they haven’t seen and abiding by rule changes they don’t like. Remember this is an eu issue. And given how clumsy Garmin has been with the AC acquisition so far why should anyone have faith that will change? Almost a year after Garmin bought ActiveCaptain, I still cannot see AC POIs on my Garmin MFD. And I cannot contribute to AC using the MFD. I don´t understand why Garmin just focuses on apps and APIs for 3rd party systems, instead of making their own hardware compatible with AC data. 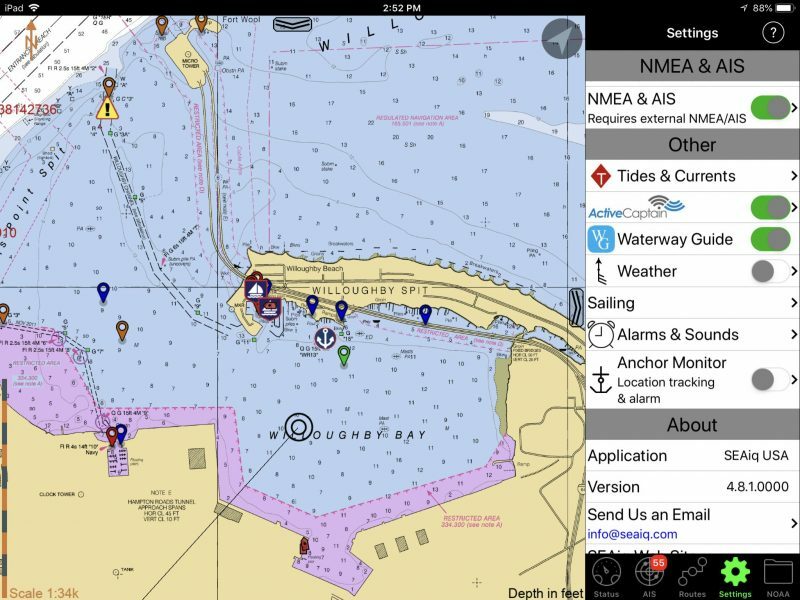 Before leaving for the Bahamas last fall, I purchased an iPad, downloaded Garmin’s BCM, and purchased their charts. It’s been a great supplement to my chartplotter. However, if my iPad dies, I now have no recourse — at least as far as getting full value from my Garmin purchase is concerned. 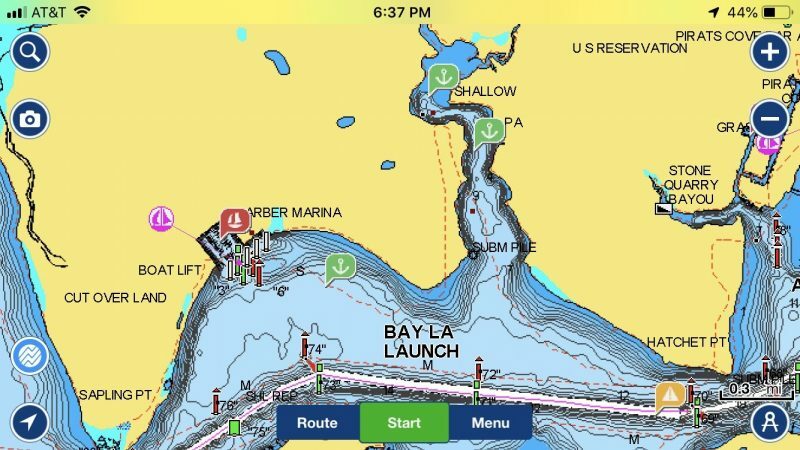 Thus I’ll never consider purchasing a Garmin product again — and I’m sharing the story with every sailor I meet. Smart move, Garmin. I spoke with Rose Point/Coastal Explorer tech support yesterday and asked what will happen to Coastal Explorer, effective May 23 when ActiveCaptain support for Coastal Explorer (and other navigations programs using ActiveCaptain) is terminated. The answer was simple: the ball is in Garmin’s court, and until Garmin releases its new API (applications programming interface*) for ActiveCaptain as revised to comply with the new EU privacy regulation, they have no idea what will be required to enable Coastal Explorer to use ActiveCaptain again. It’s possible it could be a very simple fix but seems more likely to be more complex which means more time to write, debug, test and roll out the new code. Coastal Explorer will continue to function as it does now and will be able to continue to display ActiveCaptain data downloaded up until May 23. It’ll continue work fine after that date, but no new ActiveCaptain data can be downloaded after May 23. Although they didn’t say so, what’s happening at Rose Point/Coastal Explorer may well be happening at all developers with software that uses ActiveCaptain. Until Garmin completes its revisions to ActiveCaptain and puts its API on the street, every developer using ActiveCaptain is treading water. Once the API is in hand, everyone will have a much better idea what’s required and how long the process of re-integrating ActiveCaptain will take. The playing field is not level. It’s my guess that since Garmin has the inside track on all of this and much inside information, they will have a significant competitive advantage in terms of being able to put new updated software on the street much faster than anyone else. One wonders whether that’s happenstance or by design. Don’t know about all of the he said, she said, but I do know that I logged on to AC this morning and the changes they’ve made are absolute crap. Small screen. Filters that you have to recheck EVERY time you change windows. Markers that don’t show until you focus into a very narrow area. I want my Active Captain back! !